Day 13 (Part I): Undaunted Courage – The San Francisco Bay Trail: It's Closer Than You Think! I was born in 1968, exactly one month after Martin Luther King Jr. was assassinated and almost a month before Robert F. Kennedy met the same fate. Green Bay beat the Oakland Raiders in the Super Bowl, and “In The Heat of the Night” won the Oscar for Best Picture. Nelson Mandela had already served six years in prison in South Africa and would not be released until after serving twenty one more. Something else happened that summer as well, Tommie Smith and John Carlos, American track stars who took gold and bronze respectively in the 200-meter run in the 1968 Olympics, demonstrated undaunted courage as they bowed their heads and gave the Black Power salute during the national anthem as a protest against racism in the U.S.
On the Bay Trail in West Oakland today, I came upon the iconic image of Tommie Smith and John Carlos catapulting the battle against racism in America before a global audience. 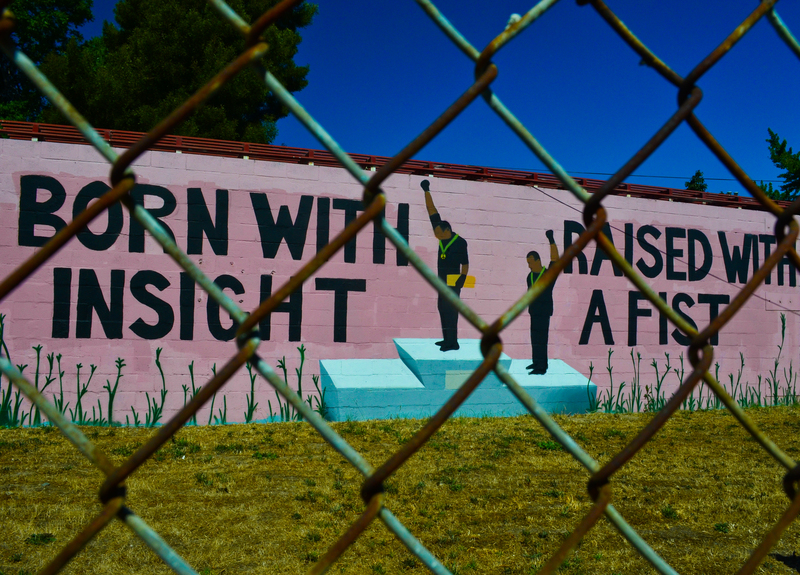 It caught my eye from a block away on the wall of a small, single story, nondescript pink building on Mandela Parkway in West Oakland. I broke free of the confines of the beautifully manicured Bay Trail in the center of Mandela Parkway to get closer. Seeing this image was important to me and I struggled with how to present it in a photograph. I captured it with and without the fence but chose to go with the fence to symbolize the racial division that still exists in our society. The Bay Trail is stunning and welcoming here along Mandela Parkway. A place that once blended into the cityscape in the shadows of the elevated, double decked Harbor Freeway, now basks in sunlight with a paved pathway and meticulously maintained landscaping. However that came at a terrible cost. The 1989 Loma Prieta earthquake destroyed the Harbor Freeway and forty two souls with it. This chain of somewhat somber thoughts was broken a few blocks down the street from the Tommie Smith and John Carlos mural. I was caught off guard by a vacant corner lot occupied by a lone chicken coop and, yes, chickens. Big, fat healthy chickens. And they had three sheep as neighbors in the empty lot next door. I can’t sum this Bay Trail section up without giving honorable mention to my walking companions, Laura Thompson, of the Bay Trail Project as well as Jenn Foxx, Executive Director of The Bay Area Open Space Council. They accompanied me for much of the hike and Laura pointed out sections of the Bay Trail currently under construction that will guide riders through the maze of freeway overpasses and up to – as well as off of – the new eastern span of the Bay Bridge. Heavy equipment was active and it was thrilling to see an urban section of the Bay Trail in the process of construction. She also brought my attention to the artist community in the old American Steel building on Mandela Parkway, a massive warehouse of metal working artists. While I would have loved to tour the entire warehouse, anything that involves working with large chunks of metal and welding rods is no place for strange folks off the street like me to be wandering around in. I was greeted at the end of this stretch at Jack London Square by MTC Public Information Officer, Brenda Kahn, who presented me with a sublime ham sandwich and peach Snapple before whisking me off to part two of Day 13 – a tour of the new eastern span of the Bay Bridge!